Do you have some wine bottles you have been saving, but don’t know which project to make with them yet? Look no further! 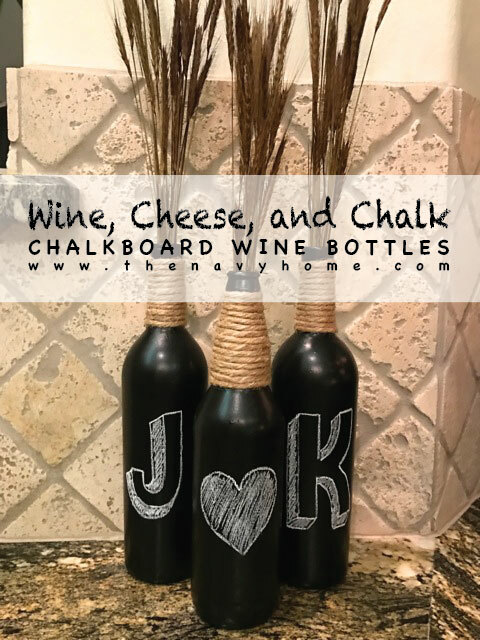 I was experiencing the same dilemma until I stumbled upon this cute chalkboard wine bottle idea. 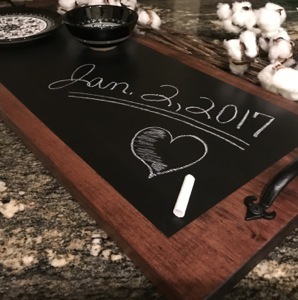 They were the perfect finishing pieces to go with my chalkboard serving tray and decorative pillow wedding gifts! 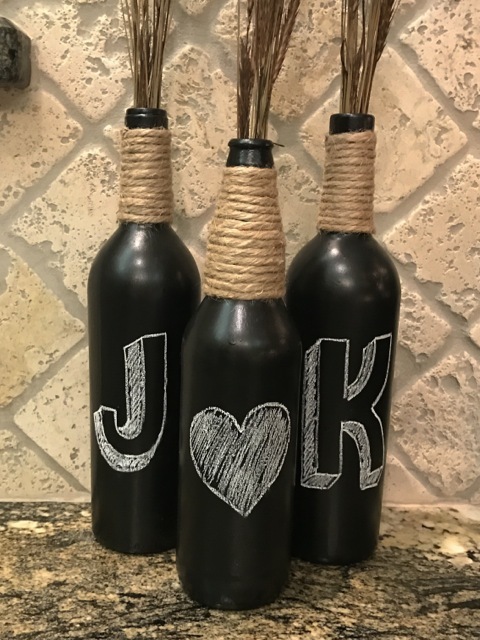 The idea of using chalkboard paint on wine bottles creates tons of versatility in the project. 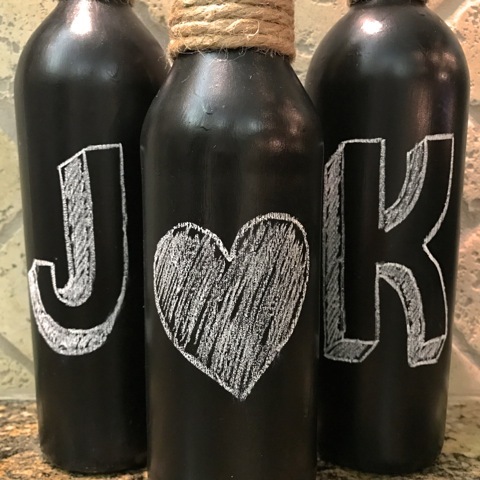 Just think with three bottles you can write initials for bedroom décor or baby showers, his and her initials for wedding showers, “JOY” for Christmas, swap out seasonal floral, and so much more! 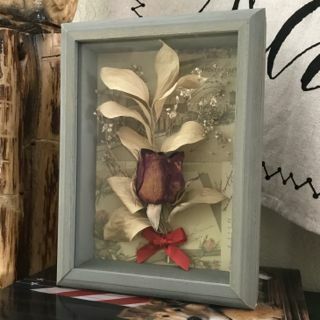 I made this set to be used as a wedding gift as well as décor for the bride’s brunch. 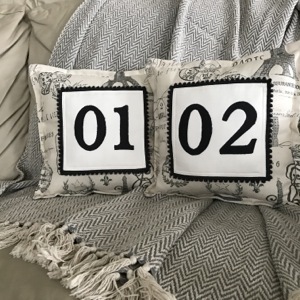 After having completed this project, I knew I had to make a set for our home too! Want to see these wine bottles in action? 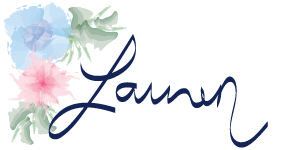 Check out our post, A Bridal Brunch (post coming soon! 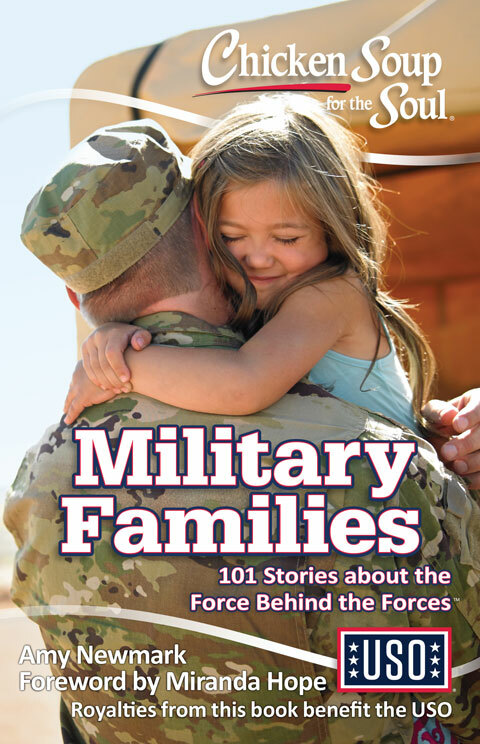 ), to see more! The first step is to determine which three glass bottles you are going to use. I chose to use two varying sizes to add dimension; two of the same size wine bottles and one spiced cider bottle. Remove the labels and any residue from the glass until the surface is free of any gunk. 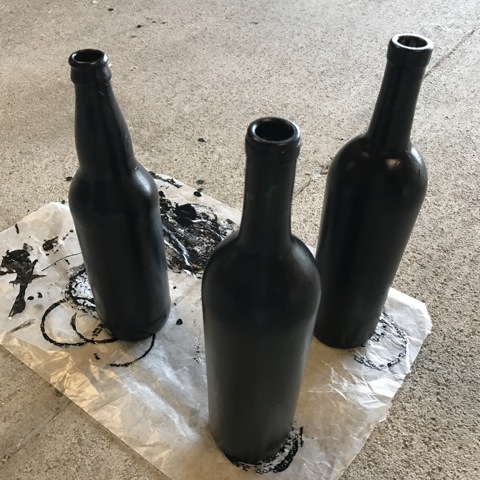 Your bottles are ready for paint! There are two ways you could go about painting your bottles: liquid paint or spray paint. I had some liquid chalkboard paint on hand and decided to use that. When working with either liquid paint or spray paint make certain to work with THIN coats; otherwise, you will end up with paint drips running down the sides of the bottle – darn gravity! Apply additional coats until you reach the desired thickness of chalkboard surface, allowing for adequate drying time between each coat. I chose to not paint the bottom of the bottles; therefore, I was able dry them upright on wax paper. The wax paper works great by preventing any residual paint from sticking to its surface when dry. Note: An option for painting the bottom of the bottles is to brace wooden dowels, or something similar, to suspend the bottles upside down. I have not personally tried this method, but have seen it done. Read all directions on your can of paint before use. Remember to stir the paint before use, do not shake. I recommend wearing a mask and gloves when applying paint along with working in a well-ventilated space. A well-ventilated space creates a cleaner workspace to breathe in and faster drying time. Let your creative side shine and start decorating your bottles! 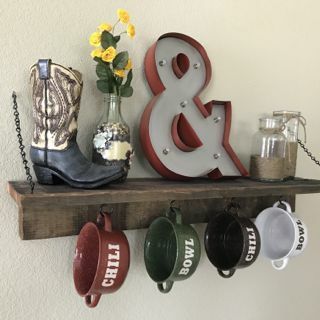 You could choose to add any fun details you like such as flowers, rhinestones, metal art, bows, etc. I kept mine simple with only using jute to remain versatile for everyday décor, holidays, and other occasions. 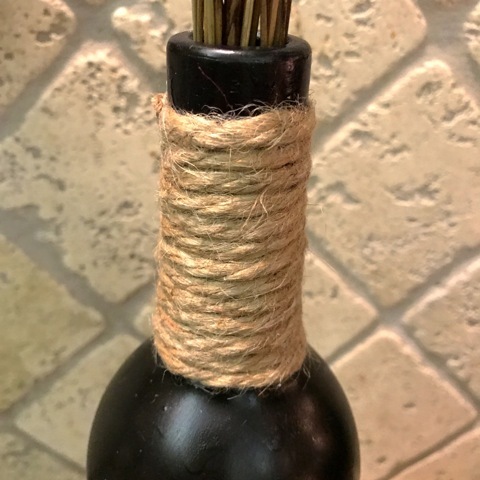 Use a hot glue gun when adhering the jute and periodically apply beads of glue while wrapping the jute around the bottle. Don’t miss out on the other posts in our wedding season series! We hope you enjoyed this tutorial! 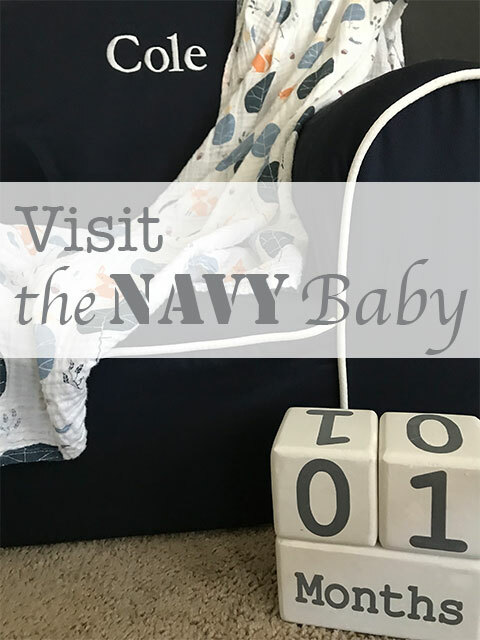 Don’t forget to leave us a comment with your thoughts!